The DW 3000 Series Hardware Pack contains a range of medium weight hardware for a mix of styles. Both the 3700 straight/boom cymbal stand features and array of drummer friendly features. 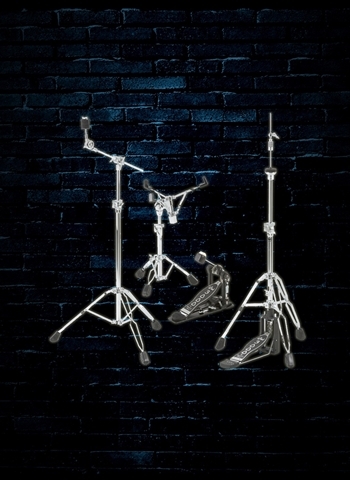 Steel double-braced legs offer optimal support for heavy snares, while the scaled-down footprint make it easy to position in between multi-pedal set-ups. 3000 Series pedal is designed for every drummer. Big on features like dual-chain Turbo drive, bearing rocker assembly, 101 2-way beater, heavy-duty all metal construction and more.